This website is about ELT -- English Language Teaching. 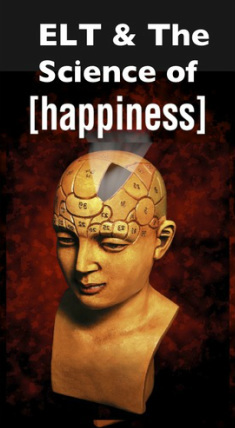 And about Positive Psychology -- something TIME magazine calls, "the Science of Happiness." It is for EFL and ESL teachers who want to use activities that work on specific language points (grammar, functions, topics and vocabulary) while having students do things that positive psychologists find are connected to happiness and well-being. Basically, positive psychology is the study of what is going on in the minds of happy people. Traditional psychology focusses on mental illness. Positive psychology focusses on mental health. As teachers we all deal with educational psychology, either consciously or by default -- we do deal with psychology. Why positive psychology in the ELT classroom? We also know that, as they are feeling good, the neuron connections -- learning centers -- are lighting up with serotonin, endorphins, and dopamine -- those "feel good" neurotransmitters that go along with learning. The site will share activities (at last count over 50 classroom tasks, 15 posters, and lots of support articles and links) you can do with your students to increase happiness while they build their English.